This month, a 744-acre reef off the coast of Fire Island is becoming a part of the largest artificial expansion in New York State history! By introducing a new marine habitat to Fire Island Reef, the DEC will not only be supporting the underwater ecosystem, but the state economy and local tourism efforts. According to a recent release by the DEC, the creation of a new marine habitat at Fire Island Reef will contribute “to [the development of] a stronger, more diverse marine ecosystem.” Created through Governor Andrew Cuomo’s Artificial Reef initiative, the habitat will provide shelter for the island’s marine life while improving fishing and diving opportunities. This is a big step in supporting jobs in the state, bolstering both the tourism and angling industries, among others. Additionally, investments made in marine habitats boost Long Island’s marine economy, which makes up about 9.7% of the region’s GDP. The DEC oversees all twelve of the state’s artificial reefs, including two in Long Island Sound and the Great South Bay, as well as eight in the Atlantic Ocean. The construction of artificial reefs in New York State began way back in 1949, and to this day, their impact continues to benefit aquatic biodiversity and the fishing industry. The latest Artificial Reef initiative has built on the state’s investments toward environmental protection, including the $300 million Environmental Protection Fund investment, $2.5 billion Clean Water Infrastructure Act, and efforts to ban offshore drilling. But how are the artificial habitats built? Apparently, with a lot of help from the Department of Transportation. The Canal Corporation and Thruway Authority have pitched in as well, together contributing about 2,000 tons of jetty stone, three decommissioned vessels, and surplus materials from the Tappan Zee Bridge demolition project. As the recycled materials settle, large fish like black sea bass and cod will find shelter in the habitat. And with fish come barnacles, sponges, corals, and mussels, covering the artificial foundation and mimicking the construction of a natural reef. 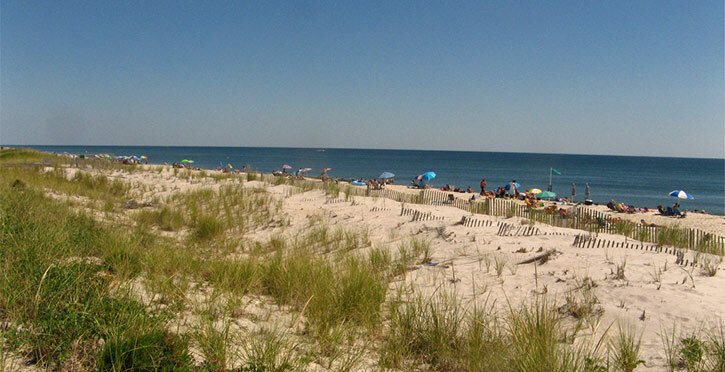 The innovative recycling process was employed in May at Shinnecock Reef, in July at Smithtown and Rockaway reefs, and in August at Hempstead and Moriches reefs. To learn more about the Artificial Reef Program, visit dec.ny.gov/outdoor/7896.html.